The Galaxy Gear smartwatch and Galaxy Note 3 may have gotten most of the attention today, but there is good news on the way for owners of older Samsung products. The battery-friendly Android 4.3 update is reportedly being prepped for Samsung Galaxy smartphones. 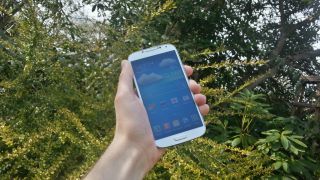 The Android 4.3 release date for the Samsung Galaxy S4 and Galaxy S3 is set for October, according to Samsung at its IFA Unpacked event. The newer Jelly Bean update is said to add Galaxy Gear functionality to the Galaxy S4. TechRadar asked Samsung if the Galaxy Note 2 would share in the Android 4.3 download fun this October or a future release date. We'll update this story when we hear back. It sounds like Samsung wants to take advantage of Android 4.3 features like fully activated Bluetooth 4.0, which would help keep the battery of the company's new smartwatch ticking all day long. Considering the Galaxy Gear is touting a battery life of just "more than a day," the low-powered Bluetooth connection found in Android 4.3 would be a major benefit for both the phone and the smartwatch. Right now, the Samsung smartwatch is only compatible with its newly unveiled Galaxy Note 3 phablet and Galaxy Note 10.1 2014 tablet, both of which run Android 4.3 with Bluetooth 4.0. Look for the Samsung Galaxy S4 and Galaxy S3 Android 4.3 updates in October, if your carrier permits it, of course.